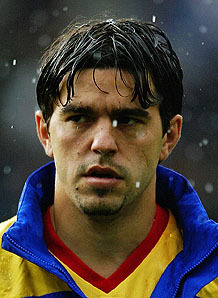 It’s a strange and delicate moment for a player with an impressive career close to the end, as Cosmin Contra, the former AC Milan and Atletico Madrid full-back, who also played an UEFA Cup final with Getafe, could be out of contract starting the first day of September. FC Timisoara, his beloved team, the club that tried so much to convince him to return to Romania, didn’t even try to have a conversation with the player on this subject. The story became public right before the second game against Manchester City, when Contra had announced that the derby versus Steaua could be his last official appearance. I guess he wasn’t expecting then to come on in the second half, score a wonderful equalizer and get a call up to the national team… Well, with or without a contract at club level, Contra has every chance to add two more caps to the 72 collected so far, as he’s been asked to replace the injured Cristian Sapunaru and should fight for a place at right back with Ovidiu Dananae. Forwards: Marius Bilasco (Unirea Urziceni), Ciprian Marica (VFB Stuttgart), Daniel Niculae (AS Monaco), Bogdan Stancu (Steaua Bucharest).